After a decade of pushing by the consumer group Center for Science in the Public Interest, the FDA will finally require that manufacturers label that there are beetles in your favorite foods and cosmetics. 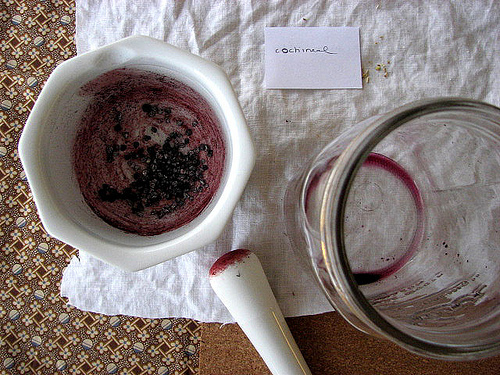 Carmine is a coloring made from the female cochineal beetle or her eggs. They dry ’em and squish ’em. It has been used for centuries as a coloring for fabrics, and it makes lovely shades of yellow or orange, and especially red, purple, and pink. It’s also used as one of those “color added” ingredients in foods. Good & Plenty, Yoplait, Dannon, and even Ben & Jerry’s have used carmine for that perfect shade of deliciousness. And I’m sure that’s just the tip of the creepy crawly food coloring iceberg. The problem is, some people are highly allergic to the cochineal, something that they don’t find out until they wind up in the ER with tight airways and red splotches. Yeah, I’m talking EpiPen allergies, here. In 1998, the CSPI lobbied the FDA to ban the coloring outright after reports of those harsh reactions. They argued that not only would the extermination of carmine in food help those with allergies, but it would also be beneficial to those who have strictly regulated diets, such as Muslims, Jews, vegetarians, and vegans. So far, the coloring has been hidden under the “color added” or “artificial coloring” blankets. The new rule will require that manufacturers clearly label products with “carmine” or “cochineal” so well-informed consumers such as yourself might avoid crushed bug juices. Delish! But what the FDA has stated clearly that they will not do: ban carmine and cochineal entirely, require the [insect] origin of the coloring on labels, or undertake or require any scientific studies on the adverse reactions. Buggy about critters in your food? Check those labels, as always, and avoid those with “carmine” and “cochineal” colorings. Images: madelinetosh and there’s a be, both on Flickr, under a Creative Commons License. I never have understood the need to put coloring in food anyways. If it tastes good, that’s all that matters. I guess I’m in the minority.